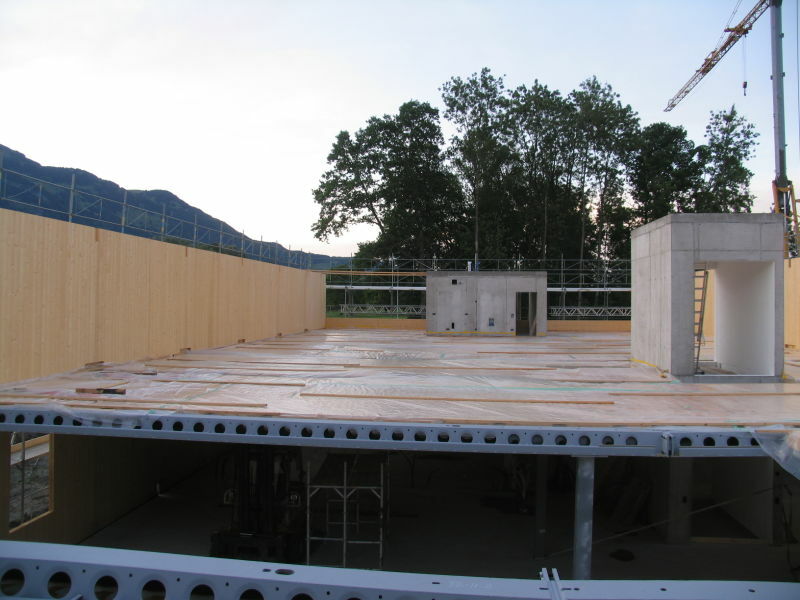 In Ruggell, Liechtenstein stands a unique building in terms of combining different construction materials. 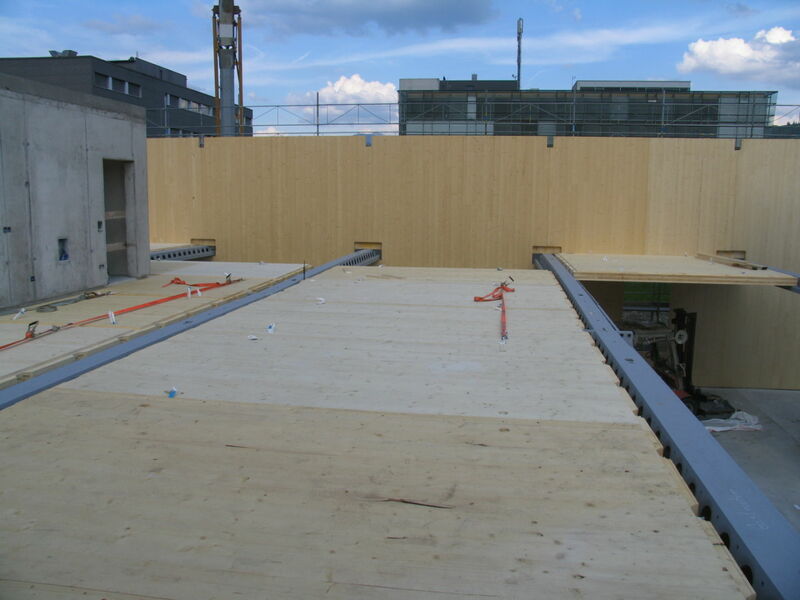 It is where Peikko’s Deltabeam was used for a wood-concrete composite deck for the first time. 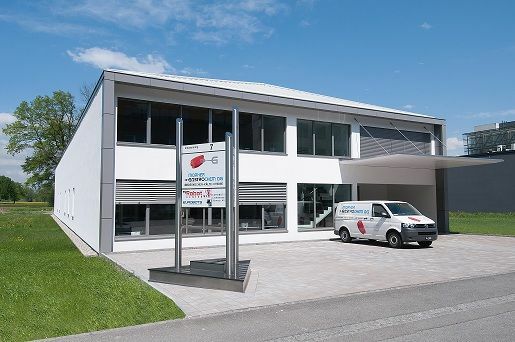 The showroom and manufacturing premises of industrial kitchens manufacturer Marxer Gastrochem AG, was completed in the summer of 2011. The discussion soon evolved into an order of Deltabeams manufactured by Peikko’s Slovakian factory. Orders were completed in January and February 2011 and the building was finished over the summer. 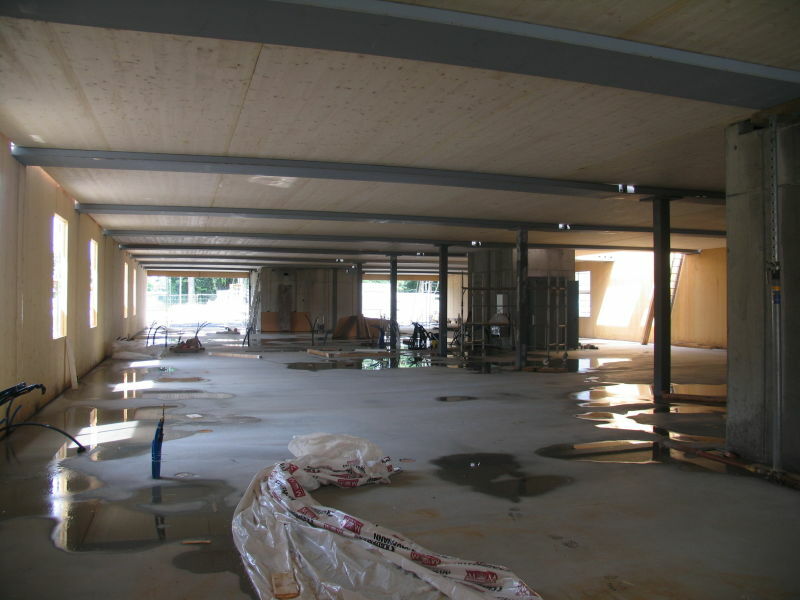 According to Denifle, Deltabeam provided an ideal solution because of the height of the rooms at Gastrochem’s premises. “There was really no space for other solutions, which are all quite high compared to Deltabeams,” he noted. The wooden floor also had to be stabilized which the static work did. 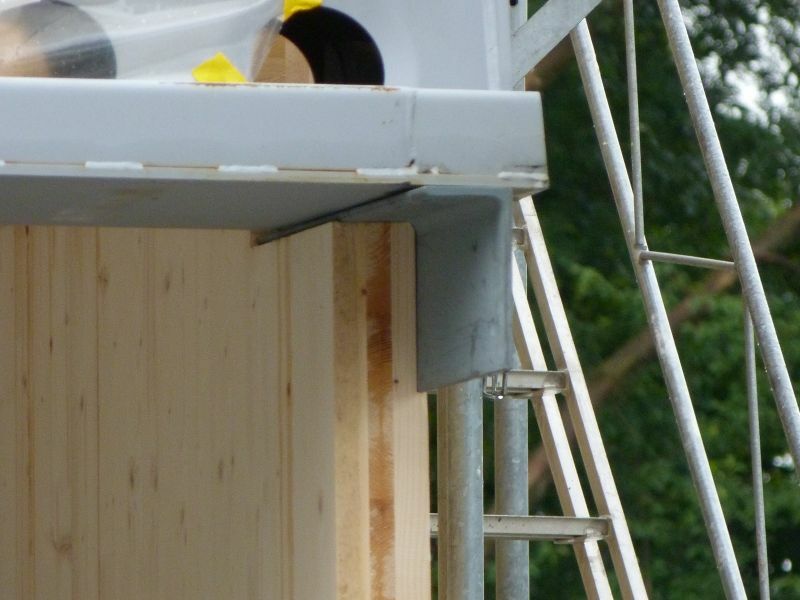 “Overall I’m very pleased with the project and keen to use Peikko’s Deltabeam again – both in connection with wooden decks as well as concrete,” Denifle said. 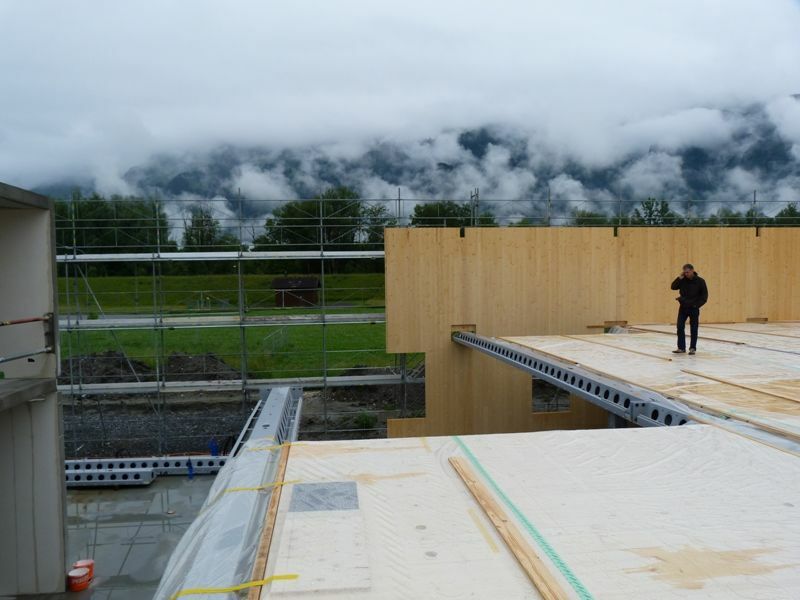 In general it is relatively straightforward to combine the wood-concrete composite slabs with Deltabeams, said Jan Gajdosik from Peikko Austria, responsible for the calculating the details. “But for this project the shallowest possible Deltabeam was requested. Slenderness ratio of the span and height was 9800/265=36/1 for a continuous beam,” he noted. The biggest challenges involved in the project were the stiff beam connection calculations, the deformations of the Deltabeam and the natural frequency of the composite deck, Gajdosik said. “Horizontal stiffness of the building comes from three staircases made of massive concrete. All outside walls are done with wooden sandwich structures,” he explained. 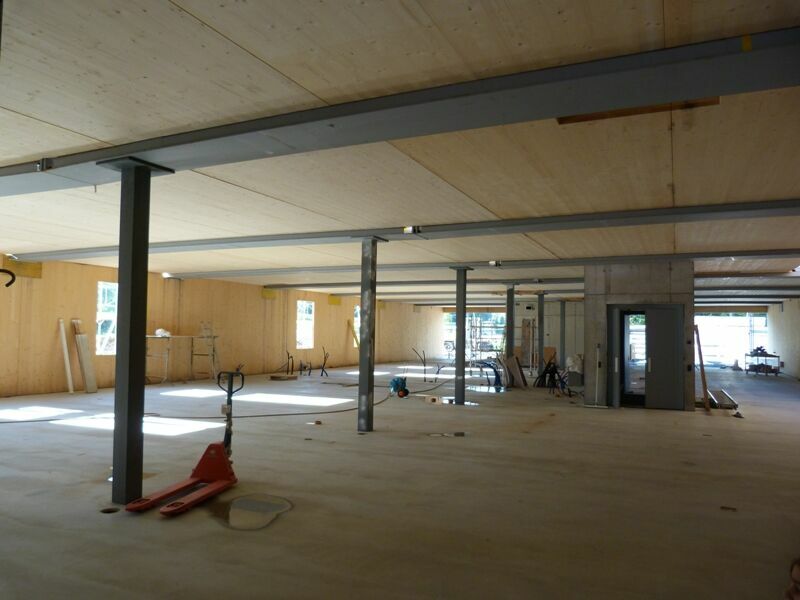 “Above the wood-concrete composite slabs there is just 5 centimetres of floor with sound isolation. There is no top concrete which could level Deltabeam deformations. To compensate dead weight deflections a small precamber was applied to the Deltabeams, which in practice appear to be horizontal due to the long span. The natural frequency structure is close to 4,6 Hz, which is very good for the usability of the deck.” The natural frequency of the building was calculated by using FEM model. Stiff Gerber connection was used to reduce deformations of Deltabeams. 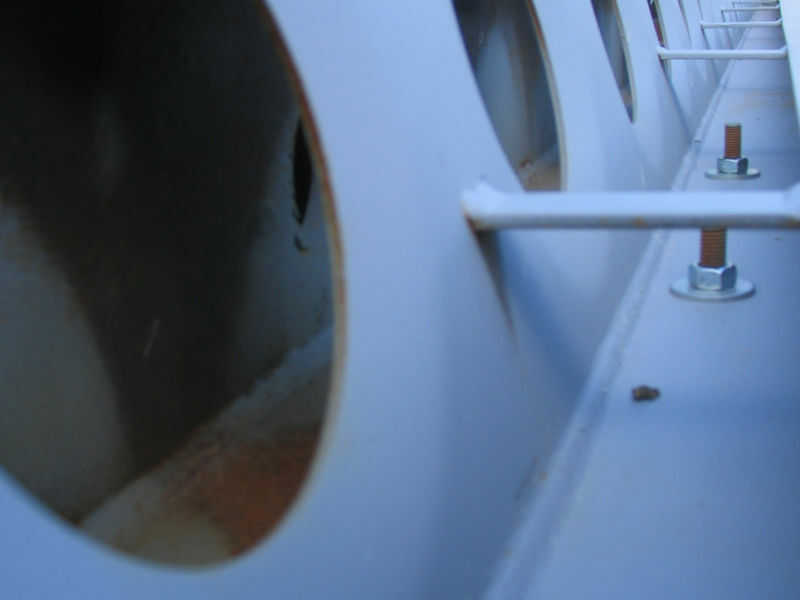 “The connection between Deltabeams was done with massive end plates in the Gerber joint and with eight instead of two standard bolts,” Riedmann added. 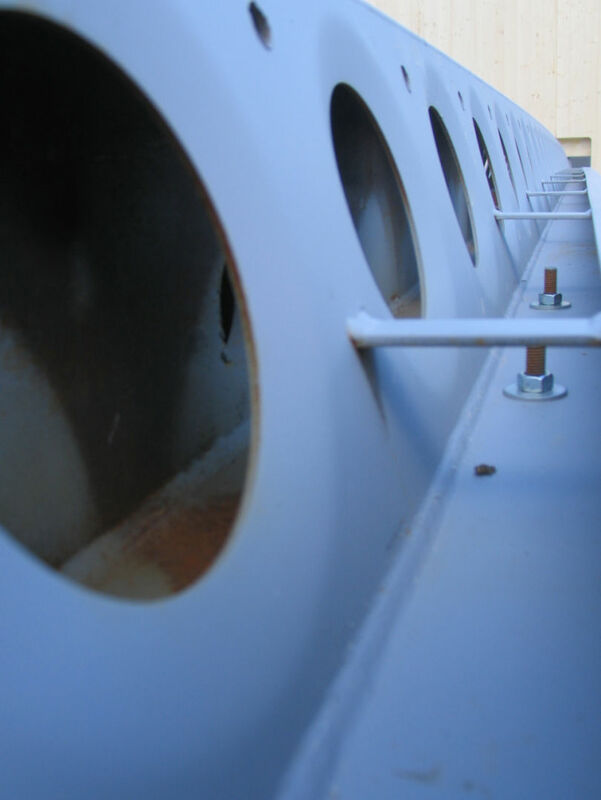 By using two long stiffener plates in the bearing area, the span lengts of main continuous beam could be reduced. This helped also to reduce the deflection of Deltabeams. 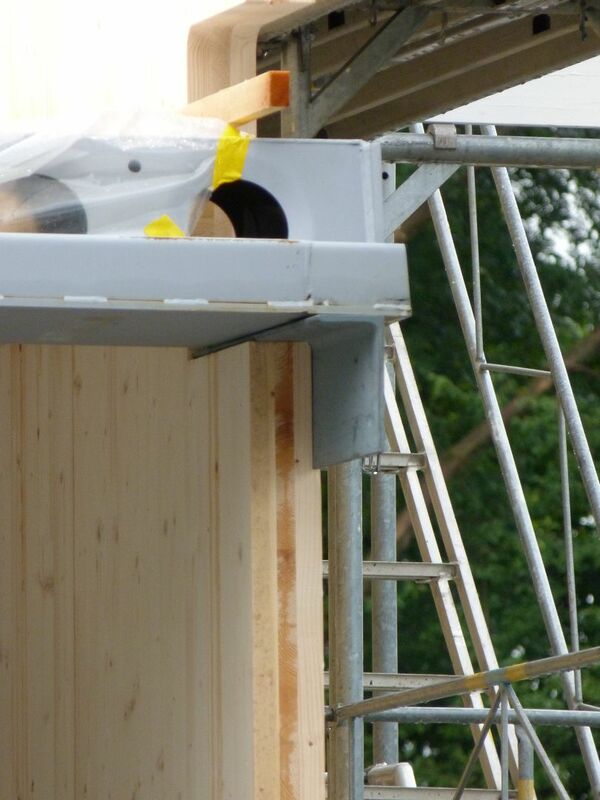 A further special detail of the Gastrochem premises is a composite connection between the wood-panel and the Deltabeam. A traditional connection between a hollow-core slab and a Deltabeam is easy to make. 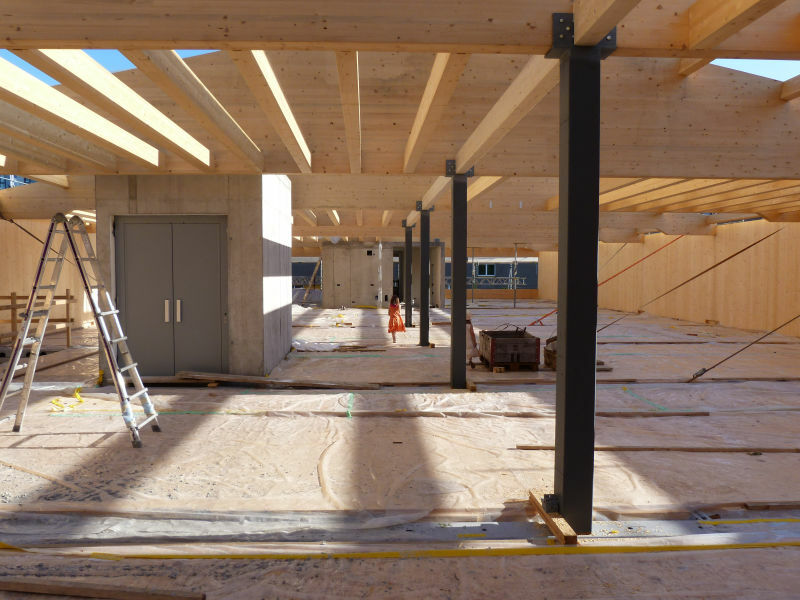 “But it was important to have full horizontal and vertical shear connection between the wood-concrete composite slab and the Deltabeam. 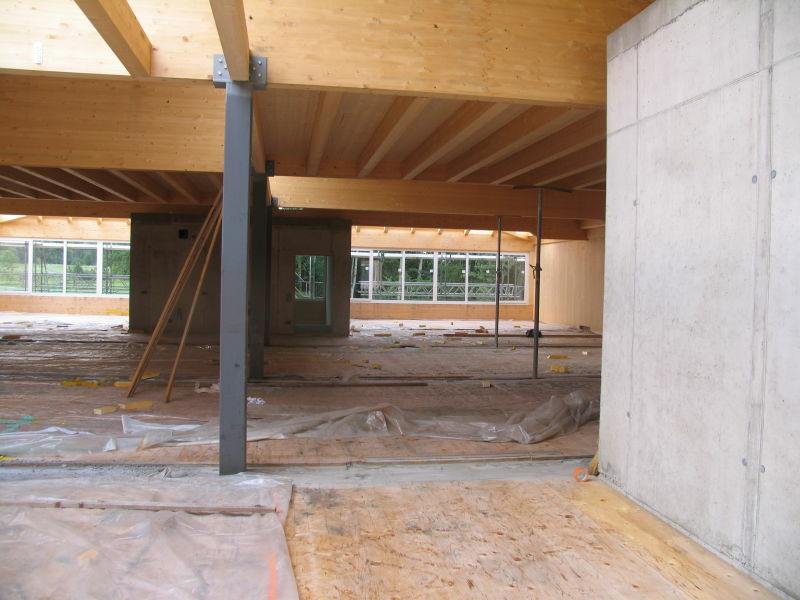 Because of this requirement it was decided to have additional shear connectors on the edge of the wood-concrete composite slab,” Riedmann explained. Denifle decided to use special shapes of shear keys in the wood-concrete composite slabs, which provided the full shear resistance. Additional reinforcements were used to provide the building fire resistance R30. After all installations the joint was filled with concrete to get the full composite connection.